Anyone else in need of some comfort this week? I’m bringing you that comfort in the form of Baby Pecan & Cara Cara Orange Sticky Buns today. You know what else brought me comfort this week? Witnessing over half a million women, men, and children marching for human rights in Washington D.C. on January 21. Millions marched in protest and in solidarity, here in America and world wide, for basic human rights of all people in our beloved country. After a weekend of witnessing this phenomenal movement it has left me with the greatest feeling of hope and comfort. It moves me to speak of it. After months of fear, dread, and frustration these warm thoughts of hope have lit a fire within me. Normally, I try not to bring anything too personal into Now, Forager. However, after witnessing the immense courage of others it no longer feels possible for me to keep this space free of what I believe today. Truth that needs to be spoken in support, or in defense, for those who are not in the majority or in positions of power. Silence does not win rights. My platform and voice may be small, but I have been reminded to never stop believing that fighting for what’s right is worth it. Now, Forager will continue to remain a space for bringing us together over desserts and pastries. A place where we can explore baking and share with those we love. However, in the moments when myself and the people in this country are hurting, I cannot stay silent. My hope is that you can understand that and join me in trying to encourage others to choose love over hate. Love over fear. 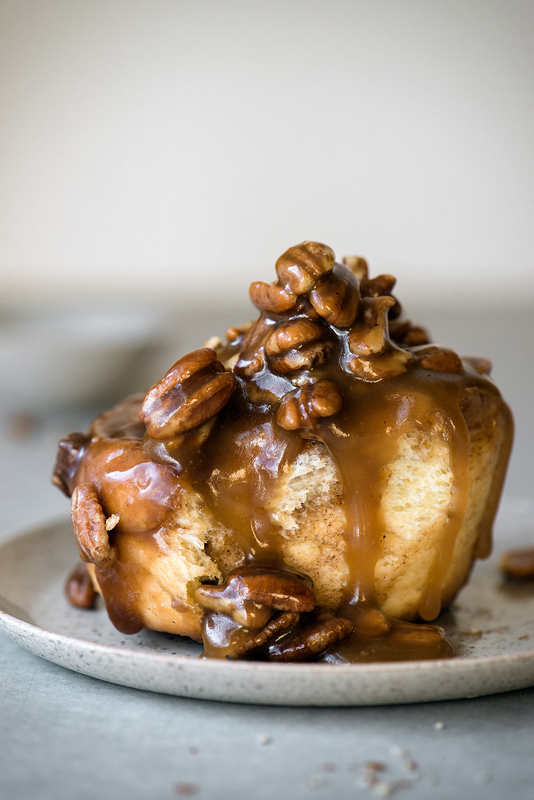 Now, let’s talk about these crazy good sticky buns that have put my self-control to shame this week. The word ‘baby’ is used to describe the size of the pecans and not as their actual name. They’re organic pecans; which tend to be smaller in size than non-organic. They have an extra buttery flavor and are extremely tender. These organic pecans are grown locally in Missouri (Missouri Pecan Growers) and they’re spectacular. Feel free to use non-organic pecans though if unable to source the small variety. Freshly squeezed Cara Cara navel orange juice is added to the brown sugar caramel glaze. Cara Cara oranges have a complex flavor with underlying notes of cherry and are very juicy. Join me in reveling in their glorious fruity aroma, extra gooey caramel, and fluffy layers. In a small heatproof bowl, heat the milk in the microwave until warm to the touch (around 110F/43C), about 30-45 seconds. Sprinkle the yeast over the warm milk, gently stir to combine, and let rest for 5-10 minutes to activate the yeast. In the bowl of a stand mixer, fitted with the dough hook, combine the flour, cornstarch, sugar, salt, and orange zest. With the mixer on low speed, add the warm milk mixture and eggs. Mix until dough is formed, about 1-2 minutes. Increase speed to medium and add soft butter, in 1 Tbsp sized pieces at a time, and mix until thoroughly combined. Once all the butter has been added, continue to mix dough for 8-10 minutes. Final dough should feel tacky to the touch, not sticky. If dough feels too firm, add 1-2 Tbsp of warm milk to soften and mix until combined. Transfer dough to a large bowl and cover the bowl surface with plastic wrap. Set in a warm spot to rise for about 2 to 2 1/2 hours or until dough has doubled in size. Meanwhile, prepare a 13 x 9-inch baking pan by lining both the bottom and sides with parchment paper. Leave a slightly overhang of parchment for easy removal after baking. Prepare cinnamon & brown sugar filling and orange caramel glaze. Once the dough has doubled in size, evenly pour half of the cooled orange caramel glaze into the bottom of the prepared baking pan. 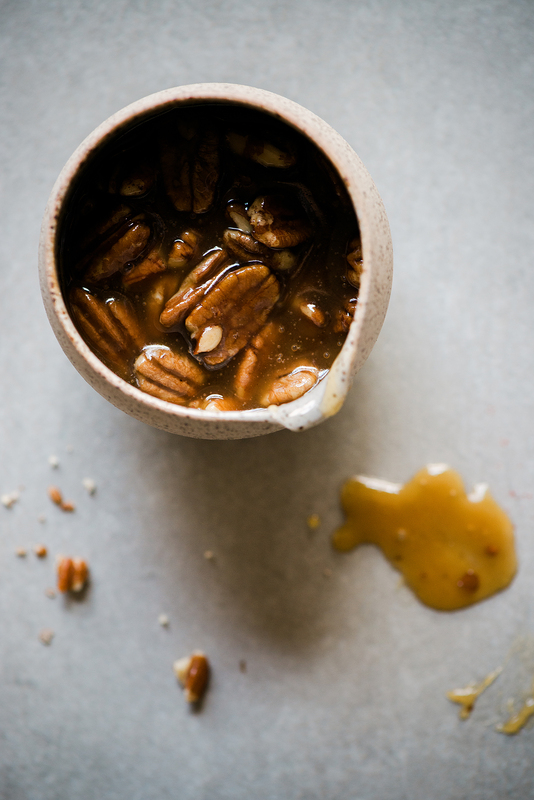 Sprinkle the glaze with half of the cooled toasted pecans. Set aside. Transfer the dough onto a lightly floured work surface. Roll the dough out into a 16 x 16-inch square. Using a pastry brush, spread on the melted butter (from filling recipe below) all over the dough surface. Sprinkle the cinnamon & brown sugar filling evenly all over the surface of the dough. Starting with the dough edge nearest to you, begin rolling up the dough into a thick log. Pinch the seams lightly to seal in the filling. Cut the dough log into eight even pieces (Tip: Cut the log in half first, then cut each half into half, and so on). Transfer pieces, cut side up, into the prepared baking pan (two rows of four evenly spaced). Cover the pan with plastic wrap and let rise in a warm spot for about 1 to 1 1/2 hours. Preheat the oven to 350F (180C). Remove the plastic wrap from the baking pan and bake sticky buns for 35-40 minutes or until deeply golden and filling is bubbling. Remove from oven and set on cooling rack to cool for 10 minutes. Very carefully invert sticky buns onto a large baking sheet or cutting board (Tip: Place a large cutting board on top of the baking pan and flip wearing oven mits. Caramel will still be warm after 10 minutes, so be careful.) 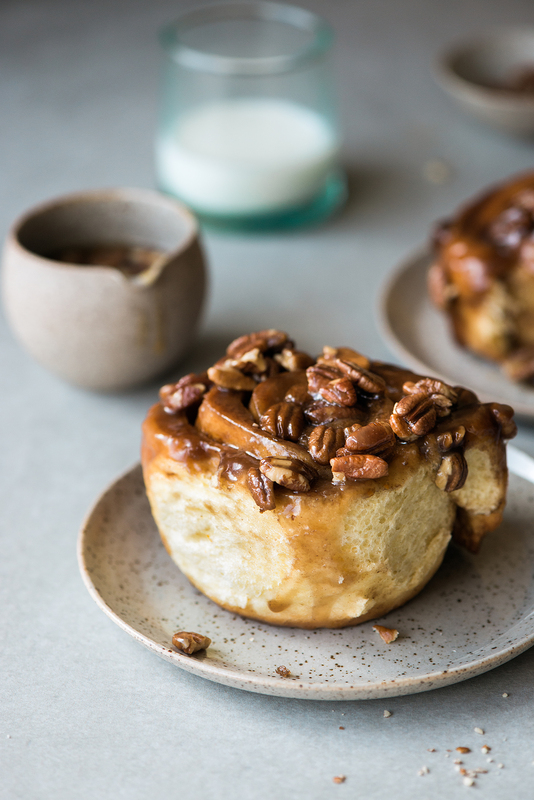 Stir remaining pecans into the remaining orange caramel glaze (rewarm glaze if needed) and pour evenly over the warm sticky buns. 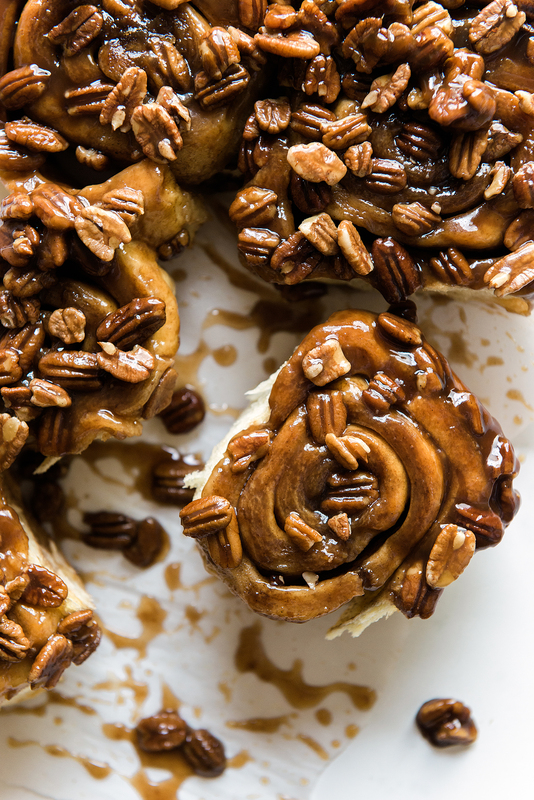 Sticky buns are best served warm or slightly reheated. Store any leftover buns, in an airtight container, at room temperature for up to five days. In a small bowl, combine the brown sugar, cinnamon, and salt. Set aside the melted butter. Preheat the oven to 350F (180C). Spread out pecans, into a single layer, on a baking sheet. Toast in the oven until lightly browned and fragrant, stirring halfway through, about 10 minutes. Remove from oven and set on cooling rack until cool. In a small pot, over medium heat, melt the butter and maple syrup. Whisk in the brown sugar, salt, and fresh orange juice. Bring to a simmer and carefully whisk in heavy cream. Bring to a boil and cook until golden brown, about 3 minutes. Remove from heat and once the caramel is no longer bubbling whisk in the vanilla extract. Set aside to cool until ready to use. I am always happy to see your email pop! I pretty much open it immediately, but pastries aside you are so right about speaking up about women’s right. The march definitely stirred up emotions for me too. Love the term baby pecans! I will keep my eyes open for them. Thank you for such kind and supportive words, Suchi! It was an empowering weekend and I’m glad to know that it moved you too. We’re all in this together. Hugs and love to you! thank you for speaking up about it; i feel like the more people make noise, the greater the likelihood that good will happen, that maybe we can all feel a little less alone. one of the few things i’m glad about is how this new political environment has mobilized the public, and people who were apathetic before (myself included) are much more involved in keeping up with the news and advocating and marching. Thank YOU for voicing your thoughts on this too, Heather. The turnout for the march surprised me and made me feel less alone. You’re absolutely right about the good side of this new political world we find ourselves in. People coming together to support their communities and to take a stand for inclusion. It brings hope and that is no small thing. Thank you for this powerful message, Traci! Your courage and conviction is inspiring. I’ll carry that with me these next several years. All my love to you! P.S. Way to stock up on those organic pecans. ;) Good call. Beautiful words and photos, lady. Give me all the sticky buns! 🙂 These are gorgeous!